TheYachtMarket.com Southampton Boat Show 2018 drew to a close on Sunday 23 September with organisers, exhibitors, sponsors and visitors all hailing the Show as a great success. A quality attendance, buzzing atmosphere, exciting new attractions and a wide range of products and services all on offer resulted in significant sales for exhibitors, with some reporting that this was their best Show ever. The Show welcomed more exhibitors than last year, with over 100 of the 500+ fleet of brands on display new for 2018. Combined, these companies showcased more boats and products than seen in recent years at the Show. This included models from leading global brands such as: Arcona Yachts, Spirit Yachts, Jeanneau and Crewsaver, to name but a few. This is a testament to the calibre of this iconic event, which is internationally ranked within the world's top 10 Boat Shows and has now celebrated 50 years as Britain's biggest boating festival. Despite the worst weather conditions the Show has experienced in over 35 years, it welcomed c. 100,000 visitors across the 10 days to an exciting programme of daily activity both on land and water. The Show's new Festival Green was packed throughout the 10 days. Housing both the Guinness Tent and the Timbers, it featured the new Heart Stage, which presented a daily line-up of experts and live entertainment. Visitors flocked to the area to hear top tips on boat maintenance, how to help protect our oceans and to meet legendary guests. Highlights included a Q&A with Tracy Edwards MBE & the rest of Maiden's crew, a cooking demonstration from the Hairy Bikers and talks from adventurers and TV personalities, Steve Backshall and Monty Halls, plus the global social media stars, Sailing Uma. Another new attraction which proved popular with visitors was the Science of the Sea Experience. Part of the Show's substantial three-year pledge to marine conversation, it drew in sailors and non-boaters alike with its highly engaging oceanographic exhibits from the University of Southampton. The brand new Harbourside Gin Festival with Pegasus Life delivered a radically different experience for regular Boat Show goers. Visitors had the opportunity to sample an array of gins from nine hand-selected local and nautical-themed brands in boutique English gardens surroundings. The Show's crown jewel, its marina, continued to welcome thousands of visitors looking to explore the hundreds of boats afloat, from the biggest boat, the Princess 30M, to the smallest watersports craft. Along with plenty of vessels available for visitors to get out on for free with the ever popular Get Afloat and Try-a-Boat brought to you by Borrow a Boat attractions. The marina also boasted two of the Show's most iconic boats, brought in specifically to in recognise the Show's 50th anniversary and Britain's sailing heritage. Sir Robin Knox-Johnston's Suhaili and Sir Alex Rose's Lively Lady are renowned yachts amongst the sailing community with both their legendary sailors and achievements dating back to the era of the first Boat Show itself. This year's Show saw exhibition space sell out in record time with a waiting list of brands eager to exhibit at the event. As the doors of the 50th edition close, organisers now look to next year's event and how it can develop to accommodate this growing demand for space, with many current exhibitors already requesting additional space in 2019. Lesley Robinson, CEO of British Marine, commented: "With such an array of boats, products, services and expertise on offer at this year's TheYachtMarket.com Southampton Boat Show, it truly was a celebration of 50 years of fun, lifestyle and excitement that can be had on the water. "It once again offered visitors of all ages, from seasoned skippers to young beginners, the opportunity to explore the marine world and get out on the water, whether that be in a kayak, dinghy, sailing yacht or RIB. "The Show has been a resounding success with an exuberant atmosphere across the 10 days and I am delighted to hear reports of strong sales from across a spectrum of exhibitors. "This year's event was very much about looking ahead to the next 50 years whilst we acknowledge our heritage. We are proud to be Britain's biggest boating festival, as well as being internationally renowned, and we are now set to look at how we can develop the Show to meet the level of interest we are receiving. "We are also looking to progress our significant environmental pledge to bring about individual engagement and signed commitment to marine conservation from all exhibitors and contractors, as well as progressing our own efforts to minimise the environmental impact of the Show." Ian Cooke from Onward Trading Company commented: "From a sales point of view this has been our best boat show ever. Yesterday was the best single sales day we have ever enjoyed at a Show. We are very pleased with this year's event and looked forward to returning in 2019." Sean Robertson, Sales Director at Sunseeker International, said: "Over the past two weeks, Sunseeker has retail sold an incredible £72 million worth of boats. TheYachtMarket.com Southampton Boat Show continues to deliver incredibly high footfall to the stand resulting in a record number of client meetings. Our dealer colleagues internationally, including the Sunseeker London Group, have seen a substantial number of existing and new visitors keen to see our award-winning range. Increasingly, we are welcoming many new boaters to the Sunseeker family. "As well as removing 99% of single-use plastic from our stand, we were especially delighted to announce the official opening of the Blue Marine Foundation (BLUE) exhibition space with help from Duran Duran legend, and BLUE ambassador, Simon Le Bon. With marine conservation as the theme for this year's 50th anniversary Show, we helped to highlight the topical issue with an immersive experience that demonstrated the importance of protecting our seas and oceans for future generations. The exhibition space welcomed over 5,820 visitors and we have received incredible feedback regarding our new marine conservation programme on the Balearic Island of Menorca in partnership with BLUE." Sarah Wallbank from August Race added: "There is no greater platform in the UK to launch a new marine product than TheYachtMarket.com Southampton Boat Show and evidence of this is how well received the new August Race range of shore clothing has been at this year's Show, with a third of our entire lifestyle stock being sold over the first weekend. The new layout in Mayflower Park has been a great success and given a palpable heart to the Show and we have enjoyed the fantastic feedback on our now market-leading detailing products from attendees soaking up the atmosphere." Richard W. Roberts, CEO and Co-founder of TheYachtMarket, remarked: "We are delighted to have been the Title Sponsor for the second consecutive year at the 2018 TheYachtMarket.com Southampton Boat Show. It is a superb event that has grown to become a major highlight in the global boat show calendar. 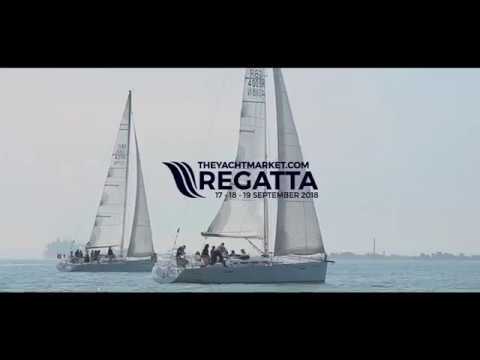 "It's a very special year for TheYachtMarket.com and the Show itself. Not only are we celebrating 50 years of the TheYachtMarket.com Southampton Boat Show, 2018 marks the 15th anniversary of TheYachtMarket, and the Show has provided the very best platform to celebrate all of our successes. "There has been an exceptional amount of people visiting TheYachtMarket stand over the last 10 days, including our very special guests, Dee Caffari MBE and Mike Golding OBE. "The launch of our Ocean Saviour project has been a monumental success following the press event that took place on the first day of the Show. We welcomed over 45 journalists and, as a result, we have achieved global support, interest and coverage around the world. Removing plastics from our oceans is something we are incredibly passionate about and we are proud of the work that everyone involved in the project has done so far." Julian Weatherill, Head of Sales & Marketing at Windboats Group - Hardy Marine, added: "Hardy Marine, owned by the Windboats Group, has had one of the best TheYachtMarket.com Southampton Boat Shows for many years. Enquiries are up 30% on last year and we have sold three motor boats at the Show. The Group also builds the fabulous Gunfleet range of luxury blue water cruising yachts, exhibiting the GF58 at the Show, which in turn has received much interest and praise for her build quality and spacious, well designed, light and airy interior." Peter Thomas, Managing Director at Cornish Crabbers, said: "We are extremely happy with the Show this year and the high level interest in our range of boats on display on the marina. We have sold boats on a daily basis, which we are very pleased with and will certainly be returning next year with an increased presence." Sean Langdon, Managing Director at Discovery Yachts Group, commented: "What a Show it has been! We are proud to announce multiple sales but the highlights being a Bluewater 50 Catamaran and the FIRST Britannia 74. Thank you to those who visited us and became part of our continuing amazing story." Stephen Pitkethly from Dad's Boats said: "We have sold more of our ornamental wooden propellers than in previous years and the quality of potential customers is definitely better this year. Having exhibited for a number of years now, visitors seem more prepared to invest in our unique pedal boat as an addition to their fleet. We have also had quality enquiries from hire companies about the commercial model we are developing. A number of post-Show meetings and trials have also been arranged." Mathew Hornsby, Sales Director at Williams Jet Tenders, added: "Despite the unpredictable weather, TheYachtMarket.com Southampton Boat Show has resulted in good trade orders and our UK dealer sold a number of retail boats with the Sportjet range being especially strong. "Our new Turbojets were very well received from both press and visitors alike, which helped to drive footfall to the stand. We also noted considerable interest in the Turbojet range from both Princess and Sunseeker dealers, who attended the Show from their native Middle East and South East Asia regions, respectively. Mark James from Trinity Marine said: "The Show was great for us, plenty of customers all week. This was our first time exhibiting at the Show and it was an amazing experience. The atmosphere was buzzing, with plenty of fun things for all the family to do. I would definitely recommend exhibiting here and we will be back next year." Craig McCarthy from MCC Marine remarked: "We have had a fantastic year at TheYachtMarket.com Southampton Boat Show. This is our third year and we are in a new location which has worked fantastically for us. We represent Nord Star Pilot & SUR Marine Luxury tenders and have taken deposits at the Show and we have a number of leads to follow up with." Richard Gibson, Sales Director at Oyster Yachts, commented: "We've thoroughly enjoyed the 50th anniversary TheYachtMarket.com Southampton Boat Show. Having the opportunity to present a beautiful example of our model range, the Oyster 575 to visitors, as well as entertain our valued family of owners in our on-water hospitality area has again proven a great success and we look forward to attending the Show in 2019." Adrien Burnand, Head of Marketing at MDL Marinas, remarked: "We had a fantastic Show, replicating the MDL Marina experience on our stand. As ever, our customer centric approach proved to be a hit with our members as they enjoyed chatting to our marina managers as well as our extensive hospitality including on-stand massages (Southampton Harbour Hotels), and Gin distilling classes and tasting (Salcombe Gin). Plus, with the great atmosphere and bustling numbers enjoying our waterside location, we raised over £3,000 for the Ocean Youth Trust South and the Blue Marine Foundation. Enquiries about MDL membership are even higher than last year, proving that TheYachtMarket.com Southampton Boat Show is a great showcase for the industry." Peter Terry from Stormtech added: "We have returned to TheYachtMarket.com Southampton Boat Show after three years with great success. This has been a very good Show, with good sales and we look forward to 2019." Mark Pullinger from Specialist Small Craft Ltd remarked: "We came to TheYachtMarket.com Southampton Boat Show launching FjordStar and Latrex brands, powered by Selva outboards to the UK market. We're really pleased in how these new products have been received. We've taken orders and we are looking forward to a very busy year ahead."